Posted by rogerhollander in History, Peace, War. December 2014 will mark the 100 year anniversary of the Christmas Truce of 1914. During 2014 VFP (Veterans for Peace) National will plan activities to share with chapters to celebrate this memorable moment in history. During World War I, on and around Christmas Day 1914, the sounds of rifles firing and shells exploding faded in a number of places along the Western Front in favor of holiday celebrations in the trenches and gestures of goodwill between enemies. On Christmas Eve, many German and British troops sang Christmas carols to each other across the lines, and at certain points the Allied soldiers even heard brass bands joining the Germans in their joyous singing. At the first light of dawn on Christmas Day, some German soldiers emerged from their trenches and approached the Allied lines across no-man’s-land, calling out “Merry Christmas” in their enemies’ native tongues. At first, the Allied soldiers feared it was a trick, but seeing the Germans unarmed they climbed out of their trenches and shook hands with the enemy soldiers. The men exchanged presents of cigarettes and plum puddings and sang carols and songs. There was even a documented case of soldiers from opposing sides playing a good-natured game of soccer. Some soldiers used this short-lived ceasefire for a more somber task: the retrieval of the bodies of fellow combatants who had fallen within the no-man’s land between the lines. The so-called Christmas Truce of 1914 came only five months after the outbreak of war in Europe and was one of the last examples of the outdated notion of chivalry between enemies in warfare. It was never repeated—future attempts at holiday ceasefires were quashed by officers’ threats of disciplinary action—but it served as heartening proof, however brief, that beneath the brutal clash of weapons, the soldiers’ essential humanity endured. During World War I, the soldiers on the Western Front did not expect to celebrate on the battlefield, but even a world war could not destory the Christmas spirit. Who better than veterans who work for peace to tell the story of these soldiers’ celebration of peace in the midst of war? Our society needs to hear this story that peace is possible. Use the great resources listed in the sidebar to reach out in a new way to new and old allies. 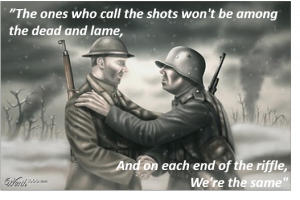 Although World War I ranks as one of the most horrific in history, causing about 40 million casualties and up to 20 million military and civilian deaths, it also included a famous and spontaneous peaceful interlude inscribed in chronicles as the unofficial Christmas truce of 1914. The assassination of Archduke Franz Ferdinand, heir to the Austro-Hungarian throne, by a Bosnian Serb in Sarajevo on 28 June 1914, plunged much of Europe into war. The Entente Powers of France, Russia and Britain stood against the Central Powers of the Austro-Hungarian, German and Ottoman Empires. In mid-September, the German, British and French commands ordered their armies to entrench along a 475-mile Western Front that extended from the North Sea to the Swiss frontier. Four years of brutal, stalemated trench warfare followed. Most trenches were about seven feet deep and six feet wide, topped by a parapet of sandbags. From there, barbed wire entanglements extended into no man’s land. In many places, the no man’s land separating German and British front-line trenches was only 30 to 70 yards wide. The elements were sometimes more debilitating than the enemy. Standing in the mud and water for days often resulted in feet becoming gangrenous. Excessive exposure to wet and cold caused nephritis, which affected the kidneys. The accumulated rubbish, urine and excreta in the trenches negatively impacted on health. Food scraps and decaying corpses attracted huge numbers of disease-carrying rats. The unwashed men attracted lice that covered their bodies with bite marks and caused “trench fever.” Artillery bursts caused some men to experience shell shock. Periodically, the aristocratic generals (safely lodged in the rear) ordered the mostly lower-class men in the trenches to make suicidal frontal assaults on enemy trenches. Machine guns and rapid fire rifles simply mowed down attacking men in no man’s land, where their bodies often remained for weeks in a decaying state. The generals never devised a sensible plan to break the cruel stalemate that trench warfare became. Then, an amazing series of events occurred. Along parts of the British, French and Belgian lines, men from both sides went out into no man’s land unarmed to meet, shake hands and fraternize. The First Battalion Royal Irish Rifles reported Germans calling out: “If you Englishmen come out and talk to us, we won fire.” Scotsmen in Flanders, the 2nd Queen’s Battalion near La Chapelle d’ Armentieres, and the 2nd Battalion Royal Welsh Fusiliers also reported Germans singing “Stille Nacht” (“Silent Night”) and extending invitations to meet in no man’s land. On the morning of 25 December, the 2nd Battalion Devons reported seeing the Germans hoist a board with the words, “You no fight, we no fight.” Opposite the 2nd Battalion Border Regiment, the process began with a German officer emerging from his trench waving a white flag. The 2nd Battalion Wiltshires reported men on both sides waving to each other, and then going out into no man’s land to meet unarmed. After initial greetings, both sides agreed to bury their dead comrades, who had been laying in no man’s land for weeks. Some Germans and British worked together in burial parties; a British soldier described a joint funeral service as “a sight one will never forget!” Members of the British Rifle Brigade gave the Germans wooden crosses to mark their graves. Once no man’s land had been cleared of corpses, some men found areas suitable for soccer games with improvised balls. In places, British and Germans ate Christmas dinner together, sharing whatever they had. They entertained each other with singing and instrumental music. Many who participated in an informal truce hoped to continue it until New Year’s Day or beyond. But the high commands sternly objected. A German Army order threatened that fraternization with the enemy would be punished as high treason. A British order warned that “Officers and NCOs allowing [fraternization] would be brought before a court martial.” In late December, the high commands ordered artillery bombardments along the front. They did the same in following years to ensure that the 1914 Christmas truce would not be repeated. Despite these measures, a few friendly encounters did occur, but on a much smaller scale than in 1914. Today, the Christmas truce of 1914 is regarded as evidence of men’s natural desire for peace and friendship, even in the context of a brutal and senseless conflict. However, the 1914 Christmas truce is not unique in history. During the early 19th century, Peninsula War, British and French soldiers at times visited each other, shared rations and played cards. Periodically, during the 1854-56 Crimean War, French, British and Russian troops gathered around the same fire to smoke and drink together. In the American Civil War (1880-81), Yankees and Rebels traded coffee and tobacco and peacefully fished from opposite sides of the same rivers. Throughout history, it has been rare for men fighting at close quarters not to extend friendly gestures and establish informal truces with their enemies.